Semaiyah bread pudding as the name suggest two delicious desserts i.e bread pudding and semaiya or vermicelli pudding clubbed into one. The bread pudding is a spiced pudding and the semaiyah pudding is very sweet and creamy. 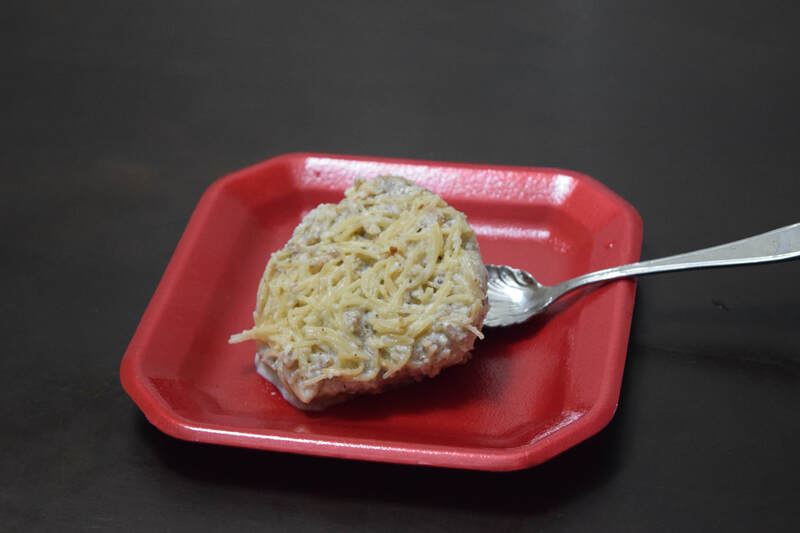 First the bread pudding is prepared and then the semaiyah pudding is poured on top and refrigerate. The Semaiyah bread pudding is served cold preferably with a dollop of vanilla ice cream on the side. ​1. Spread the bread cubes on a baking sheet and drizzle melted butter over it and bake it in a preheated oven at 300 degree fahrenheit for about 3 - 4 minutes or the bread is crispier. ​2. In a large bowl, Whisk together milk, eggs, sugar, cinnamon powder, nutmeg powder and vanilla essence. ​3. Spread the baked bread cubes on a prepared baking tin of 9" x13". And pour the above milk mixture evenly over the bread. Allow the bread mix to sit and soak for about 15 - 20 minutes. ​4. Then bake it in a per heated oven for about 30 - 35 minutes at 350 degree Fahrenheit till a crust is formed on top. 5. Remove from oven and let it cool before cutting. ​1. Fry the semaiyah in butter or ghee till its brown in color ( it will take around 8 - 10 minutes). 2. Now add sugar and mix well. ​3. Then add milk and nutmeg powder and boil well till its thick and reduced to almost half its quantity. ​4. Then add honey and mix well. ​5. Add fried raisins on top and freeze for at least an hour. ​Add the semaiyah on top of the bread pudding with a dollop of vanilla ice cream. 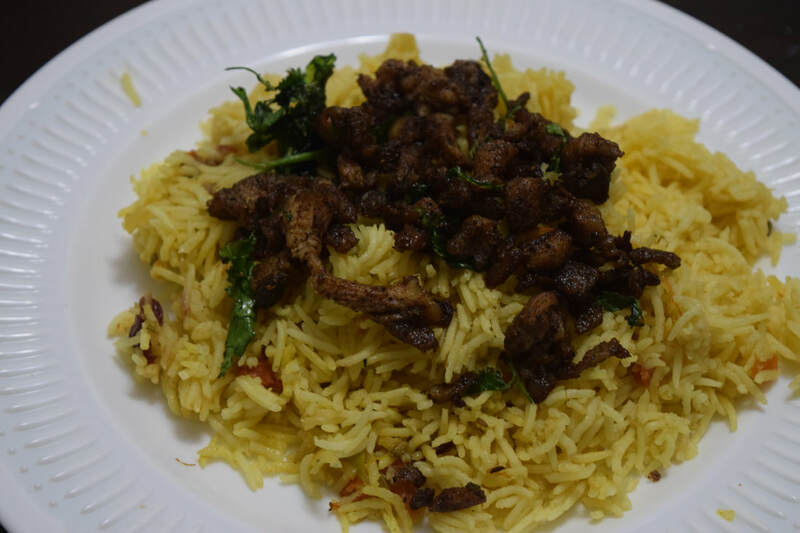 The shredded chicken biryani is a twist in normal biryani. 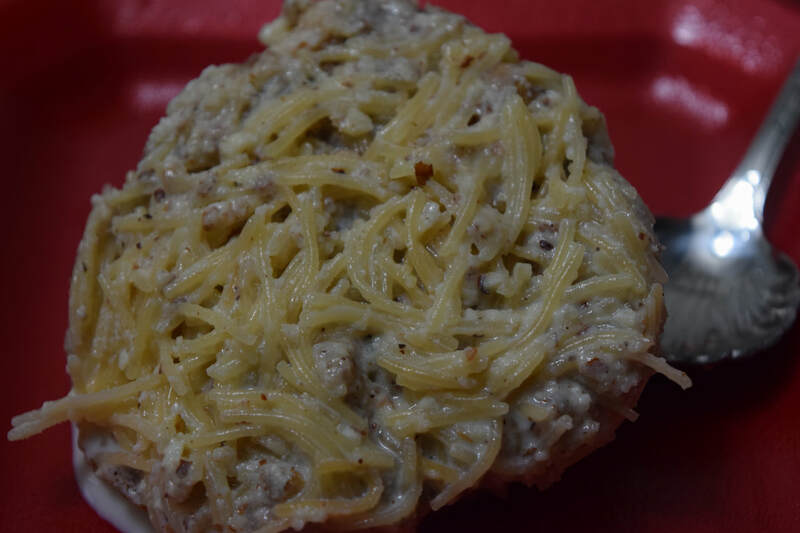 The minced chicken is well marinated and fried. The rice is cooked separately with the vegetables and served along with the fried chicken. This is a tasty yet easy preparation. ​1. Marinate the minced chicken pieces with shawarma masala powder, black pepper powder, lime juice and salt for at least half an hour. ​2. After the resting time fry the chicken piece in oil and keep aside. ​3. Heat some oil in heavy bottomed pan and fry cinnamon stick, cloves, cardamom pods and black pepper corns for a minute. 4. Add the chopped green chilies, ginger and garlic and fry for few minutes. ​5. Add the chopped onions and fry till it golden brown on a low to medium flame. ​6 Then add the grated carrots and fry till its tender. 7. Add the turmeric powder, coriander powder, red chilly powder and garam masala powder and fry for few minutes. 8. Then add chopped tomatoes till its roasted well. ​9. Now add the soaked rice with enough water and salt and cook for the required amount of time approximately 10 minutes till the rice is well done. 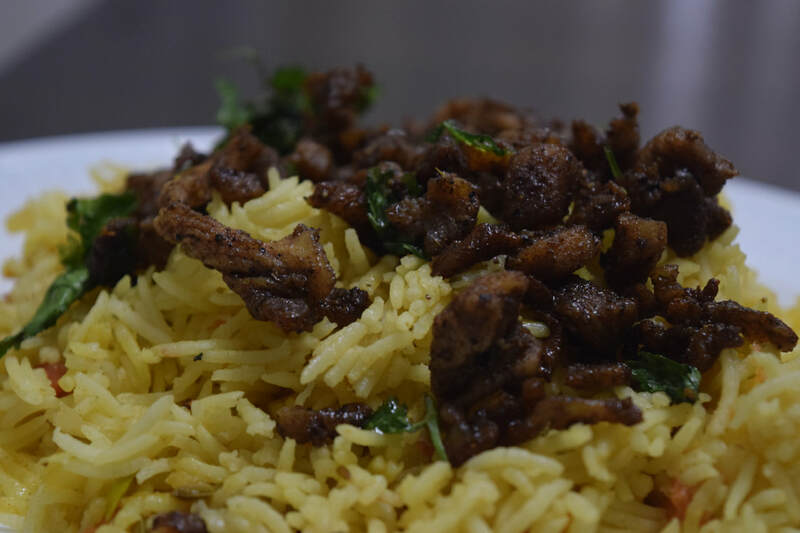 ​Serve the rice with fried chicken on top and garnish with fried cashew, raisins, fried onion and coriander leaves.